It's plausible to think that some people are better at math than others (though if you speculate about why, you may be fired, like Larry Summers) (though this is interesting). But no one of normal intelligence "can't do math." Of course, this is how Marc dressed up his dog for Halloween. 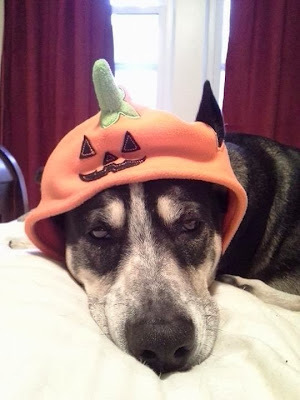 So, even though he's good at MATH now, he has two "pupkins" in his house. (He'll probably try to blame Janet). People eat more if they need to sleep. Explanations smack of "Just So" stories, but it makes sense: 10,000 years ago, if you weren't getting enough sleep, you were under severe stress and probably in danger. Needed to eat to keep your strength up. Because humans probably slept 10 hours a day or more, normally. Just laying around. So, if your kid is eating too much, get him to sleep more. And you are hungry, take a nap. 1. A tale of two systems. 2. Art Donavan talks to Johnny Carson. A football time capsule. 3. Regulating psychics in Salem. (from Zach Weiner). Author says the town is "picaresque." I don't think that word means what she thinks it means. It may be picturesque, but I doubt it moves around much. 4. Some Art Carden, on WalMart. 5. The 24 very most Hipster Highlights in History.